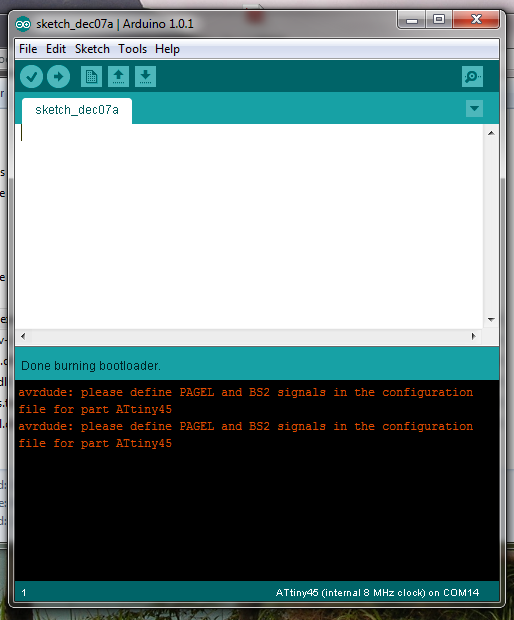 This is a post on getting the range of Atmel ATTiny microcontrollers working with the Arduino IDE. I was wanting a quick and easy way of programming smaller microcontrollers, for when the 28pin ATmega328 is just a bit too much. I looked at the range of 8-pin ATtiny microcontrollers via a comparison list here. I was already using the ATtiny-85 for the TV-B-Gone kit, so I had a few of those lying around. Here are my collected notes on getting a ATtiny 45 and ATtiny 85 running via the Arduino IDE. A MAKE article on using the ATtiny range of microcontrollers. An MIT article on programming an ATTiny via an Arduino. A project to develop an ATTiny core for the Arduino platform. An Instructable on the same process. I decided to follow the MIT article, which has an Arduino core for the ATTiny45 and AtTiny85 (both 8-pin ICs but with different memory sizes (4kb and 8kb respectively)). I downloaded this ATTiny core from the GitHub repository. This needed to be extracted to a new folder wihin my Sketchbook called ‘hardware’. I opened the latest version of the Arduino IDE (Integrated Development Environment) and then had a look at Tools -> Board and found there were lots more boards listed, including the range of ATTiny 45 and 85, all with different clock speeds (1MHz & 8MHz internal, 1,8 & 20MHz external). We will be using the Arduino Uno as an ISP (In series programmer) for the ATTiny45. There is not enough room on the ATTiny45 to have a bootloader installed all the time, hence we use an additional Arduino as the ISP. This could also be one of the available ISP programmers. To do this we have to load the ‘ArduinoISP’ (from the Examples menu) onto the Uno board. There should not be any problems with this. Arduino REST to GND – use a 10uF capacitor. The next thing to do was to upload a ‘blinky’ hello world program. This will just blink an LED on and off. This did not work. After an hour or so of head-banging, I saw this comment: “Arduino 1.0.2 has a bug that stops it from working with this tutorial.” I had recently upgraded to version 1.0.2, but it turns out this will not work. Luckily I still had version 1.0.1 installed, so I tried that. I finally used this ATTiny core downloaded from here. I reverted back to Arduino IDE v1.0.1. Again I put the ‘ArduinoISP’ onto the Uno, which worked as usual. Then I opened the ‘Blink’ code and changed the output pin to be 0 (rather than 13). I added an LED and 1k resistor to this pin (pin 5 of the ATtiny45). Finally! It came to life and started blinking. I can now program ATTiny ICs with the Arduino as an ISP. You will just have to trust me that it was blinking…. I set myself a little design challenge to test out this small device – I had been wanting a battery monitor which was visually interesting and easy to read. I had already produced a kit for a battery voltmeter, but wanted an even more simple device to read a voltage and display that information without using a number-based display. So my challenge was to read in an analogue value and then control an Red-Green LED using PWM to display that information. The idea was to have a glowing ‘heart beat’ for a battery based system. This would slowly glow in different colours if it was happy and then start flashing quicker if there was something wrong. A Red-Green LED was used as it would show red, yellow and green (by PWM of the various outputs), but only needing 2 outputs. It also needed to be very low power, so must go to sleep for quite a lot of the time. First thing is to be able to have PWM outputs on three pins. Using the ‘Fade’ example I tested if the PWM worked on which pins. I found that this sketch worked for pins 0,1 and 4. I am sure that it would also work on 2,3 and 5, given some cleverness (Update: this would have to be implemented using software, as only pins 0,1 and 4 have native PWM outputs) , but I wanted to keep things simple and I only needed three output PWM channels. I had a bag of Red/Green LEDs from Phenoptix which I was wanting to use in a project and this seemed like the ideal device. I decided to write code to change between red, green and yellow (via a mix of red and green). The resistors on the output need to be chosen carefully. I used 1k resistor for both red and green and , due to the lower ON voltage of the red LED, it overpowered the green LED. Here is the VERY simple code. Its designed as a starting point. (Note: I should work out the correct resistor values, along with brightness levels). So that meant I had PWM control sorted out. This example proved that the analogRead() function worked well. In order to implement serial data on the ATTiny range of ICs, we must implement software serial (there is no in-built USART). This also means, to get the timing correct, we must run at 8MHz, so we must use the ATTiny45 @ 8MHz. Also, due to the slow clock speed, the fastest data transfer rate we can use is 4800 baud (we can use 1200, 2400 or 4800 baud). Another thing to note is that we cannot use the RESET pin on the ATTiny (PB5), as if it is held low for a length of time then the device will reset. I had thought I would use this pin, but I think I will just stream data out and then use other devices to read that data stream and act depending upon that. I managed to get Software Serial working quite easily, using the code below. You can see that I am using pin 4 as the Tx cable. Pin 5 is the Rx, but I am not planning on using this. If you have other pins available I would use those. I uploaded the code using the Arduino as an ISP. This seemed to work. 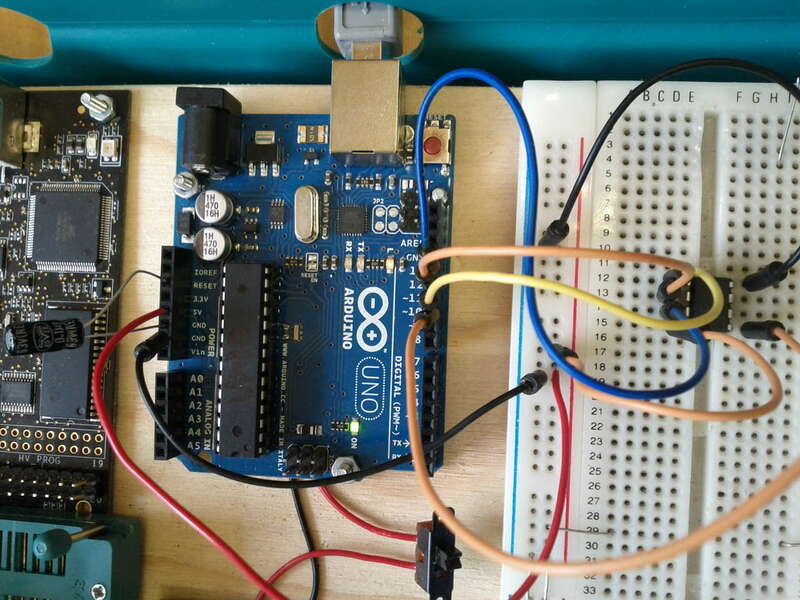 You must then remove the 10uF capacitor and reprogram the Arduino Uno with a blank sketch (remember to change the Tools -> Board to Arduino Uno again). This will allow the Tx and Rx to work correctly so you can read the data from the ATTiny. I wired the Tx from the ATTiny45 to the Rx of the Arduino Uno. Open the serial monitor and you should see data being transferred. Here is the code I uploaded to the ATTiny45. Here is an update with regards to using floats within the ATTiny. I needed to do a calculation which resulted in a float value. I might change how the calculation is done so I can just stay using integers, but for now I came across this issue. I was trying to implement a float along with a division calculation. This means including the “#include <stdlib.h>”. When searching for this error I found that, if the file is larger than 4kB, then there is a bug in the compiler which casuses this error. It happens with all the ATTiny8x series (with memory >4kB). I downloaded the whole ATTinyCore and then followed the instructions from the link above. Basically you need to replace the ld.exe program which is hidden within the Arduino hardware folder. 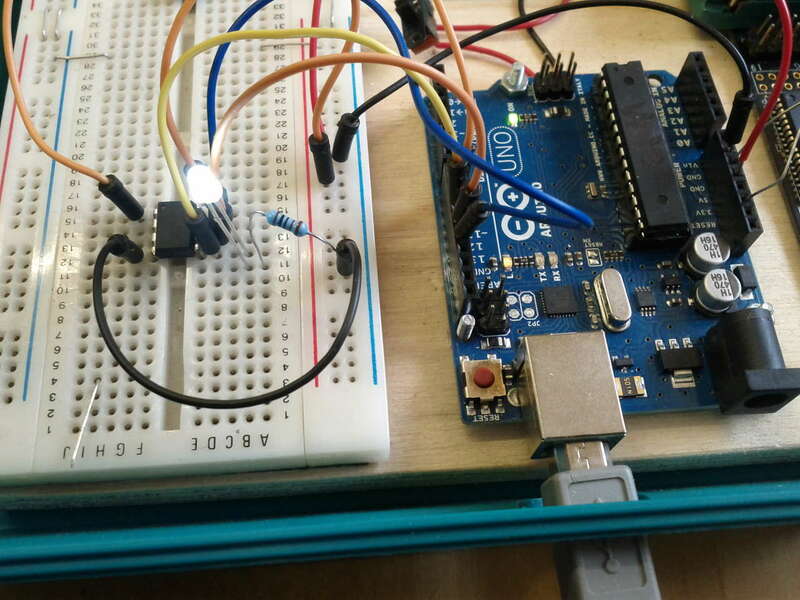 The actual location is: ‘Arduino folder’ -> ‘Hardware’ -> ‘Tools’ -> ‘avr’ -> ‘avr’ -> ‘bin’ and it should be there. I renamed the ld.exe file to ld_old.exe (as a back up just in case) and then copied and pasted the ld.exe file from the above link. I now have my ATTiny85 and was trying to program it. The problem is that the ATTiny range comes with 1MHz clock enabled. To change to 8MHz clock you must change some of the fuse settings. Its all noted here, but I did not think about it when first doing this. To do this you must set up everything as if you were going to program the ATTiny85 (as shown above). You then have to set the board you require (in my case ‘ATTiny85 @8MHz internal oscillator’). Click on Tools -> Burn Bootloader. This will set the fuses correctly. This step only needs to be done once with each IC. You can then upload code and it should run at the correct speed and use Software Serial. One of (hopefully) the last things I needed to do was to write data to the EEPROM. This was as simple as using the ‘EERPOM read’ and ‘EEPROM write’ examples. The ATTiny85 has 512 bytes of EEPROM. Thanks so much for posting the max serial speed of Attiny. I was trying to build a robot with three tiny chips acting as one and couldn’t figure out why they would never work. It seems the arduino ISP will not warn you if you try running the SoftwareSerial at 9600 on tiny chips. The include is the software serial library, as this IC for not have an in-built serial port. I think the Tx and Rx must be defined or else the code dies not know what pins to implement the serial port on. I need a help, please, I try this code but I’m getting >⸮>~⸮>>⸮>⸮⸮>>⸮>⸮⸮⸮> on the serial output. I changed the baud rate to 4800 and 9200, but it’s keep returning error. My attiny works on a lot of others codes, like a simple blink led, sleep mode, SSD1306 OLed, RTC DS1307. Others serial tutorial return error either. The Attiny 85 does not automatically support serial at a baud rate of 9600 without an external crystal for timing (16 MHz). So without knowing much more about your applciation, I would suggest it is due to lack of external clock freq control. The internal clock is 8MHz which might work for 9600, but also might not.